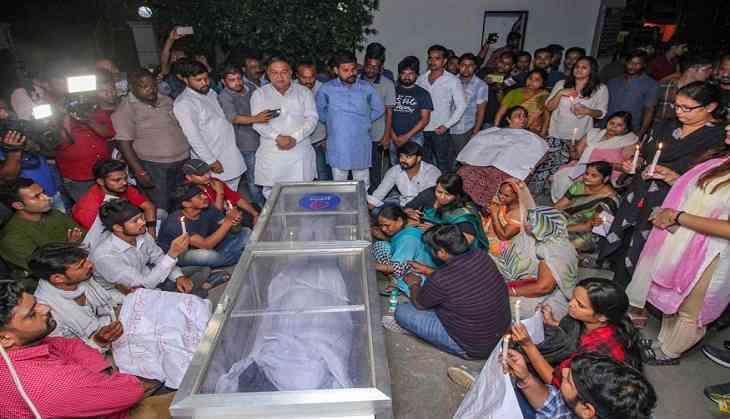 Former Uttar Pradesh Chief Minister Akhilesh Yadav has called for his successor, Yogi Adityanath's resignation from the post after a youth was shot dead by an on-duty cop in Lucknow, allegedly after he refused to stop his SUV car for checking by policemen. Vivek Tiwari, an executive of multinational technology company Apple, was returning home in the early hours of Saturday, when he was allegedly shot on his chin for refusing to stop his vehicle by patrolling cops. While the constable claims that he fired at Tiwari's car in self-defence as it tried to run over his motorbike, the incident has put the Uttar Pradesh police in a tight spot. Speaking to ANI, Akhilesh Yadav said, "It's very unfortunate and can't imagine how such an incident took place. But what else will you expect from Bharatiya Janata Party Government in Uttar Pradesh? There have been numerous fake encounters under this government." Adityanath, however, denied that Tiwari's killing was an encounter, and assured that the investigation will be handed over to the Central Bureau of Investigation, if required. "It was not an encounter. An investigation will be conducted in this incident, and if needed, we will order a CBI inquiry into the incident," he told media on Saturday after the incidence sparked an outcry from people, politicians and the victim's family against the excessive use of force by the police. The eyewitness, a woman who was travelling with Tiwari in his car when the incident took place, has poked holes in the police's claim. Speaking to ANI, she said, "The car was never stationary and it was moving. The police had no reason for coming and shouting at us. They may have misunderstood the presence of a lady in the car. It made no sense of what they did and why they did it. My statements have been misrepresented. It wasn't that I felt like a bullet has been fired (as reported by some media) but in reality, a bullet was fired. He had no injury in his head and he was hit on his chin." The accused cop, Prashant Chaudhary, has been arrested and a murder case has been registered against him. However, explaining the incident he claimed that he took out his service revolver only to scare Tiwari. Chaudhary, demanded that a First Information Report be registered against the deceased for trying to run over him. Speaking from Gomti Nagar police station, Choudhary said, "I did not shoot him. He hit me with the car first. I asked him to come out of the car. He reversed his car twice and tried to run over me. I was on the ground and took out my pistol only to warn him. The pistol was loaded and a shot got fired. I did not fire and had no intention of shooting him. The man fled from the spot after being hit by the bullet." A Special Investigation Team (SIT) has been formed under Superintendent of Police (Crime) to probe into the incident.